Question 1: What was your inspiration for A Vegan Ethic? Answer: After writing a how-to book on animal activism and a book that explores animal exploitation around the world, I wanted to write something that would serve as an introduction to the animal rights movement and to veganism. Something that would appeal to people who want to go vegan or who are just curious about veganism, people who have been vegan for years, and also a book that vegans could give to their non-vegan family and friends and say, "This is why I'm vegan." But I also wanted to write a book that would get people talking about the relationship between animal exploitation and the oppression of marginalized humans. Everything that is done to animals is done to human beings. So just from an activist's point of view, I wanted to explore these issues because we're not going to achieve liberation for animals or anyone else unless we understand this. And I wanted to highlight some of the activists who are including both human and nonhuman animals in their activism. I really see my role as a journalist here, because it's their work I am reporting on. Question 2: How does this book differ from other books about veganism? Answer: This book takes a holistic approach to veganism, regarding it as a path to compassion not only for animals, but for humans. It's a concise introduction to animal rights, and it's a guide to going and staying vegan, but it also explores the connections that all forms of oppression and systems of inequality share, which include power and privilege. There are all kinds of privilege: gender privilege, white privilege, body privilege, economic privilege, English-speaking privilege, class privilege, and so on. Society gives such groups an unfair advantage, often without realizing it. A person with privilege generally doesn't see it, so it causes them to not acknowledge a problem. I should add that being male or white or part of an advantaged class doesn't inherently make someone a villain, any more than being an animal lover inherently makes someone a vegan--it's not what you are born with that matters, but what you do with it. Privileged people (myself included) take many things for granted, and overcoming privilege is especially challenging, since it is virtually invisible. Question 3: You devote a chapter to human rights and focus on this issue throughout the book. Why this is relevant to veganism? Answer: The public often accuses animal activists and vegans of not caring about humans. And while it's true that some activists have devoted themselves to a single cause, there are actually a great many activists who work on other social justice issues alongside animal rights. As these activists so beautifully demonstrate, we don't have to ration our compassion: we can care about humans as well as animals and work toward liberation for everyone. In fact, as many of these activists have pointed out, we're not going to have true liberation for one oppressed group if another remains oppressed. Human rights are intrinsically linked to veganism not only because veganism is about compassion toward animals, which includes humans, but because so many plant-based foods are produced through the exploitation of humans. So as vegans strive to live "cruelty-free" lives, they must consider all the systems of oppression that impact what they eat and wear. Question 4: You suggest that people have empathy for slaughterhouse workers. Why do you think this is important? Answer: Let me begin by saying that I abhor the animal cruelty that goes on in slaughterhouses. But the same spheres of oppression that exploit and torture animals are also harming humans inside slaughter plants, and we must be conscious of these cruelties before we can dismantle them. No one wants to work on a slaughter line killing animals for a living. Not only is the work distasteful and psychologically traumatic, but it's dangerous and the workers are generally mistreated. Many of the people working in slaughterhouses are economic refugees who have traveled to the United States for whatever work they can find to support their families. Again, I am not defending the killing of animals - I'm just saying that the people who do this work are also oppressed. They suffer from depression, on-the-job injuries, and exploitation. Because they are often in the U.S. without documentation, and may not speak English, they're often afraid to speak up for fear of being fired - or they simply don't understand all their rights as workers. Rather than vilify these people, let's attack the cruel and oppressive systems that support the commodification and killing of animals. Let's acknowledge the role that consuming animals plays in contributing to the abuses suffered by humans as well as non-humans. After all, it's the popularity of meat that creates a demand for slaughterhouses and the suffering they inflict. Question 5: Can you talk about some of the activists who inspired you and the work they are doing? Answer: Oh, so many. lauren Ornelas, the founder and director of Food Empowerment Project has been doing really remarkable work on behalf animals and humans. Right now, for example, in addition to her work promoting veganism, she's leading a third-annual school-supply drive supporting the children of farm workers, asking people to donate backpacks and school supplies to the kids of the people who pick the produce we all eat. She's also my partner, so I get to learn from her every day. I've learned a lot from pattrice jones, an extraordinary author and the co-founder of VINE Sanctuary. This is an LGBTQ-led and ecofeminist sanctuary in Vermont that helps rescued farmed animals and challenges patriarchal attitudes. I really appreciate pattrice's views on ecofeminism. And I have so much respect for Carol J. Adams, author of The Sexual Politics of Meat. This 1990 book was a big eye-opener for me. It examines how our society consumes nonhuman animals and human females, so she's demonstrating how the exploitation of these two groups is part of the same system of oppression. In fact, it was Carol who first showed me the connection between sexism and speciesism. I'm also a big admirer of Aph Ko, the founder of Black Vegans Rock. Aph uses digital media as a platform for change. She does videos, and she blogs, and she provides some really insightful critical thinking on issues relating to race and animal rights and other topics. Then there's Breeze Harper, the founder of The Sistah Vegan Project, which is an online forum that focuses on how veganism is affected by race, racism, sexism, heterosexism, classism, and other social injustices within the lives of black females. Lori Gruen, a feminist philosopher and an author, is another person who's influenced me. She teaches at Wesleyan University and works on ethical theory and ethical practice. And I must mention the late Marti Kheel. Marti was the founder of Feminists for Animal Rights. She was such a remarkable person. I'm really lucky to have spent a little time with her, and her writing - especially her book Nature Ethics - had a big impact on me. 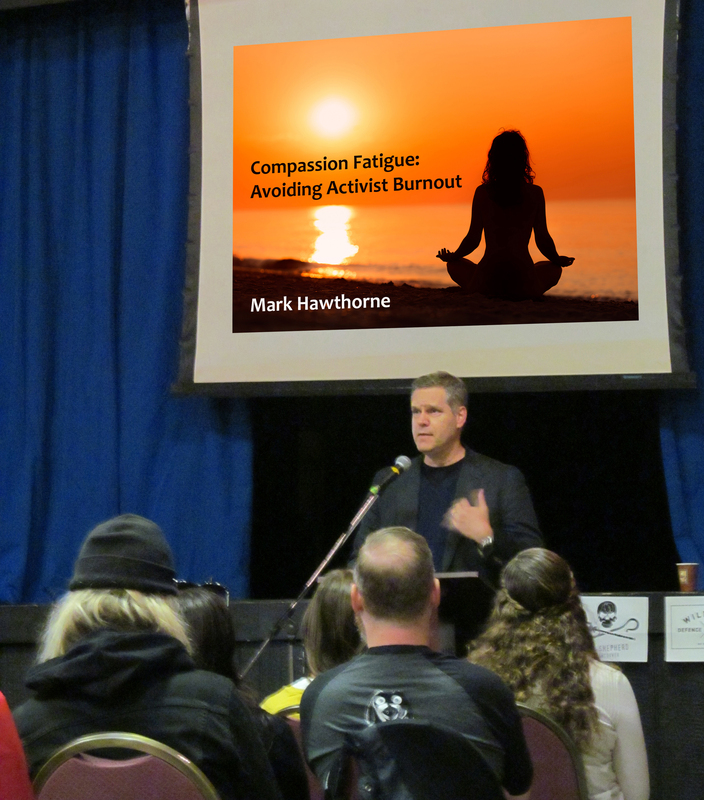 Mark Hawthorne is an activist and the author of three books on animal rights and social justice: A Vegan Ethic: Embracing a Life of Compassion Toward All, Bleating Hearts: The Hidden World of Animal Suffering, and Striking at the Roots: A Practical Guide to Animal Activism, which empowers people around the world to get active for animals. He stopped eating meat after an encounter with one of India's many cows in 1992 and became an ethical vegan a decade later. He blogs about activism at markhawthorne.com, and you'll find him tweeting @markhawthorne. Tim Ward is the co-owner of Intermedia Communications Training and co-author of The Master Communicator's Handbook - a resource for experts and thought leaders seeking to create meaningful change.